My post on iPod car integration got slashdotted last night. That really caught me off guard! It is pretty incredible how fast the hordes of new visitors arrived. I only noticed about 1 hour later that the server had gotten insanely slow. It didn't crash though (Thanks Debian ;) ). So I made a static page of the post and (mod_rewrite) redirected to it. That brought the server back to normal speed. 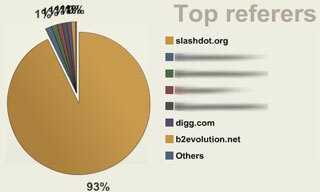 Of course slashdot is now my top referrer of the week... by far (as shown by b2evolution). Ironically, I actually submitted the post to digg.com, but it was slashdot who picked it up! Sure digg shows on the pie chart, but it's actually less than 1% referrers.